HoshiDict is an application for webOS that allows you to access dictionaries in the StarDict dictionary file format. The StarDict dictionary file format is rather popular, and dictionaries in the format can be readily found online. HoshiDict does not require a network connection, so HoshiDict may be particularly useful while travelling and no data connection is available (or one that doesn't cost an arm and a leg). 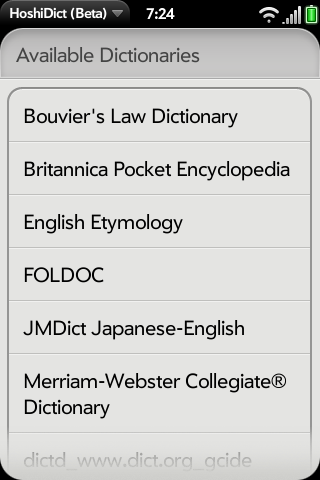 Before accessing the dictionaries on your webOS device, they will need to be loaded onto the device. If you're using webOS 1.4.5, you'll need to create a folder named "HoshiDict" manually on the device's USB drive (this is fixed in later versions of webOS; the folder is automatically created the first time HoshiDict is launched). If you have HoshiDict open when you load dictionaries on the device, you may need to restart HoshiDict for it to see the new dictionaries. This is very much a work in progress; I made this app because I plan on travelling overseas in a few months and didn't want to pay a lot to use an online foreign language dictionary. The current set of features satisfy my basic requirements to make it usable for this scenario (it's usable, but very few bells and whistles). Any suggestions, comments, or feedback would be greatly appreciated.